"music which lives and breathes, and changes direction in a moment"
"there's virtuosic guitar work from Pritchard which would appeal to fans of Yo La Tengo and Stephen Malkmus"
"Lost Left are gone and we'll never hear this album played live"
LOST LEFT are Ben Pritchard (vocals, guitar), Bobby Crawford (Drums) and Chris Pollock (Bass). They had been playing together live for a few years before front man Ben Pritchard wrote a collection of songs reflecting a long period of living in relative solitude that make up the body of their debut, Levollinen. The album title is a Finnish word meaning calm and peaceful. The songs are based around ideas that occupied Ben’s thoughts at the time, including writings by Charlotte Mew, Plath, Betjeman, Rousseau and works by Alvar Cawén (which is the main aesthetic thrust of album). 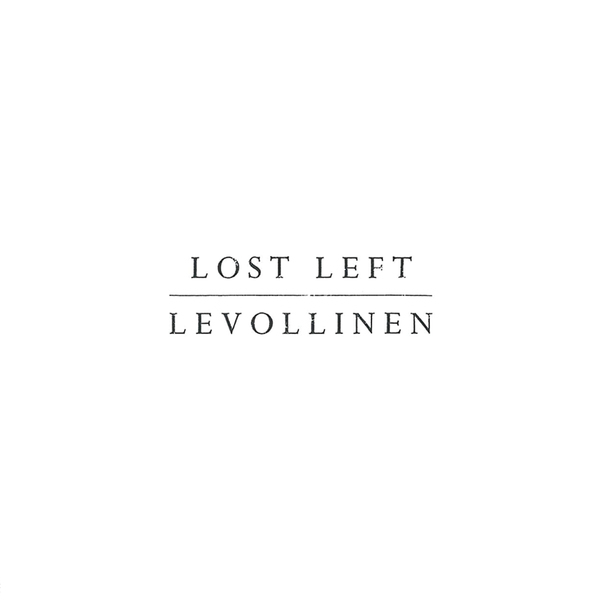 Sonically, Levollinen has a nod to the fragile vocals of Jason Molina, the post rock spirit of Mogwai with the shambolic pace of Arcade Fire. Levollinen was recorded in and around Ben’s home in South London over the course of half a year. The band subsequently took a trip up to Glasgow to record more songs with Marcus Mackay in his old converted coach-house which is home to The Diving Bell Lounge (Kathryn Joseph, Trembling Bells, Alasdair Roberts, Snow Patrol, Frightened Rabbit). LOST LEFT played shows around London, including a show at the oldest building in Hackney, St Augustine’s Tower, built in the 13th Century. It is a unique and beautiful place to perform and they remain the only band to have ever performed there. LOST LEFT quietly self-released this album in 2012, and after Ben packaged off a handwritten note and 7” sampler to Jarvis Cocker and Gideon Coe at 6 Music it resulted in a few radio plays, as well as selling out their home-made CD stock at Rough Trade. But life happened; they disbanded, and are no longer playing together, meaning this album is unlikely to be played live again. However, on Hits the Fan Records’ re-launch in January 2015 (for the release of now critically acclaimed Kathryn Joseph’s album), the label knew that their next big album release had to be this album from LOST LEFT - an unearthed gem of an album that deserved to be heard and celebrated as one of this decades hidden and understated musical masterpieces. Note: Ben Pritchard is now a London based solo artist/musician using prepared acoustic guitar, voice and percussion. He has a new solo release coming in summer 2016. LOST LEFT \\ Thank you for the Lung 7"